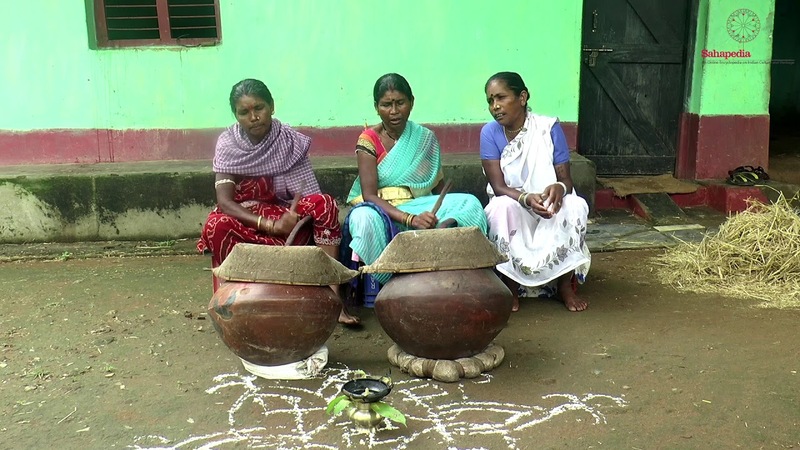 Women of Chhattisgarh making chauk made out of rice flour. Chauk is a sacred space on the floor demarcated by patterns made by hand. Patterns are made from rice flour which is considered auspicious. Paddy is also seen to be a form of Lakshmi in Chhattisgarh. Lakshmi Jagar is a ritual in which Lakshmi is invoked as the presiding goddess of rice. Dhankul , an assemblage of household objects associated with the use of rice doubles as a musical orchestra to create ritualistic music. The space in which these objects are kept is marked by chauk.